Get ready to impress everyone at the range when you show up with your new bow. The PSE Ready to Shoot Stinger X looks like it means business and doesn’t fail to deliver on that promise. It’s an incredible compound bow that’s easily customizable for the average archer and will leave your competitors in the dust. Whether you’re still fairly new to archery or a seasoned pro, you’ll love the confidence and power that you feel when shooting this bow. It’s perfect for target practice as well as going out hunting. 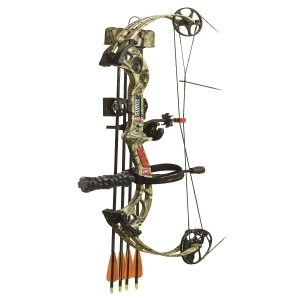 With an FPS of 316-308, this bow is strong enough to accomplish any task you put it to. Get ready to have fun like never before when shooting this bow! The PSE Ready to Shoot Stinger X boasts a customizable draw length of 21 to 30 inches. You can also change the draw weight to 50, 60, or 70 pounds, thus increasing the max FPS. Axle to axle the bow clocks in at 32.5 inches and has a brace height of 7 1/8 inches. You’ll love the included Whisker Biscuit rest and Gemini sight as they’ll improve your shooting and make you move confident as you practice. Be prepared to shoot your best. This light bow delivers a smooth, fast shot that will stun you with its speed and accuracy. The pros of buying and shooting the PSE Ready to Shoot Stinger X are numerous. From the easily customizable settings that allow you to truly make the bow your own to the quick and easy sighting, you’ll love the speed at which you can have this bow set up to your specifications. That ability makes this bow a wonderful one for the truly picky archer. Gone are the days when you couldn’t make your bow exactly what you want it to be. With the PSE Ready to Shoot Stinger X you may never need to buy another bow. With such an advanced bow that has so many pieces you can change and adjust you’d think that there would be a long list of cons associated with buying and using it. With the PSE Ready to Shoot Stingeer X though that’s just not the case. Any cons would be that it can be difficult for the beginning archer to use. It can be overwhelming to decide how to set up your bow when there are so many options and the last thing a new archer wants to or needs to do is spend time getting frustrated fiddling with settings. Once the bow is appropriately set up, however, any archer of any skill level and strength can shoot right away! Online reviews of this bow are shockingly overwhelmingly positive. You’ll be hard pressed to find many if any complaints about how this bow works once it’s set up. The archers who have it and use it love how easy it is to operate and get set to their specifications. It’s rare to see so many people loving a product and not having many complaints about it! We recommend this bow for the more seasoned archer or for the beginner who has a strong support of archers to help them set it up appropriately. As always, make sure to be in contact with the company to double check any warranty that you get on the bow. Sometimes accidents during manufacturing happen and there are defective bows of every brand out there. You just don’t want to get stuck with one. From the reviews and specifications of the PSE Ready to Shoot Stinger X, however, you seem to be getting a high quality bow that will last for years to come. Where you are looking for a good hunting bow or something for target archery, this will fit the bill either way!